New Zealand superyacht builder McMullen & Wing announced that it has secured the 10-year refit of 34-metre motoryacht VvS1. 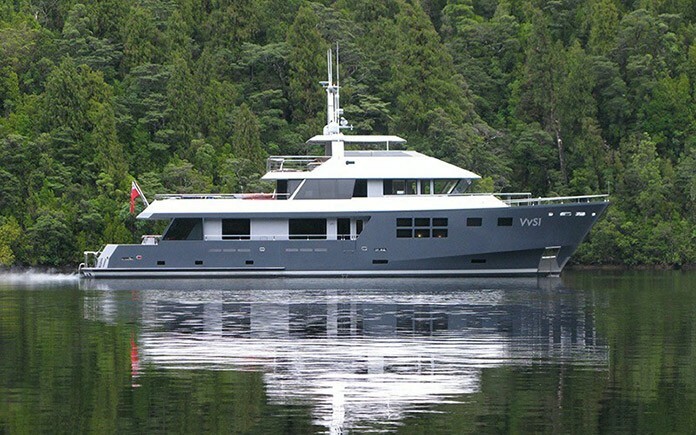 Designed by Gregory C. Marshall and built in New Zealand in 2007, VvS1 has a busy 2016 summer cruising schedule ahead before being hauled at McMullen & Wing’s Auckland shipyard in April 2016 for an extensive programme of works. VvS1 won the World Superyacht Award in 2008 for Best Motoryacht Under 40 Metres, as well as three more awards at World Yacht Trophies in Cannes. The yacht is owned by New Zealanders Sir Michael and Lady Christine Hill, two of the country’s most prominent yacht owners. The yard is proud to be applying their world standard expertise and craftsmanship to a quality yacht that reflects its luxury expedition ethos. With many decades of experience in refit work and a longstanding working relationship with Marshall – who penned the yard’s acclaimed 45m Big Fish and the inbuild 50m Hull 1016 – McMullen & Wing’s reputation for superior quality work is an excellent match for the esteemed VvS1, and is a project that the company is delighted to be working on. McMullen & Wing has a reputation for building some of the finest and most capable luxury yachts in the world. An internationally acclaimed custom yacht builder with specialist new build and refit capability up to 60m, McMullen & Wing is rare in the yacht building world for their ability to build to the highest world standards in steel, aluminium and advanced composites, leading to the moniker “A Jack of All Trades, and a Master of Every Single One”. McMullen & Wing continues to quote new projects up to 60m, both refit and new-build and, with substantial waterfront facilities, has one new build slot available for 2016 start.